Happy Monday babes! Why do the weekends seem to go by so fast? It almost seems unfair to have a week drag by and then to have the weekend go by in the blink of an eye. But one of my favorite parts about the weekend is brunch! It's no secret that I'm a huge fan of brunch (hello bubbles!) so I love getting to try out new brunch spots in Orlando. Luckily there is definitely no shortage of new brunch locations so this weekend we headed to check out one of the newer spots, Bulla Gastrobar. 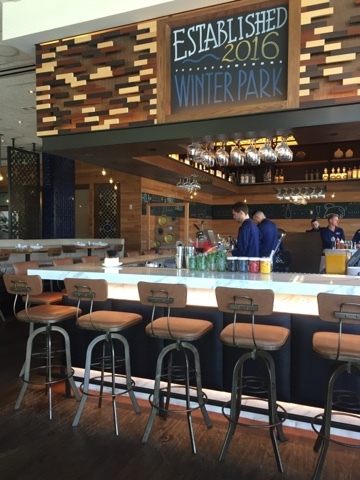 Bulla has three locations in Florida, Coral Gables, Doral and most recently Winter Park. Kerri, the boys and I headed bright and early-ish to the newer Winter Park location for some yummy eats and of course some mimosas! 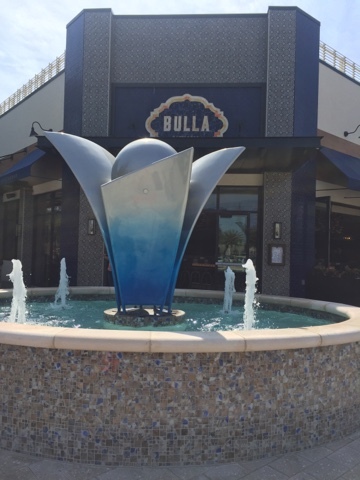 From the outside, Bulla is adorned with gorgeous blue Spanish tiles with a colorful fountain at the entrance and a cute little outdoor patio. The inside is decorated in wood, white and more blue ties giving it a very Spanish/Mediterranean vibe. Bulla has two different options for brunch; a tasting menu where you can select three things from a prix fixe menu or you can select things from their tapas/brunch menu. But the best part (at least for this champagne loving gal) is they have bottomless mimosas and sangria for only $15! Sold! I struggled between the tapas menu (I have a hard time saying no to patatas bravas) and the regular brunch menu but I ended up going with the patatas bravas and pork skewers, both of which were amazing! We also ended up sharing some meats and cheeses which were also delicious! I will definitely be heading back to Bulla for happy hour, brunch, and all of the above (and below!). amazing place and delicious food..
Oh goodness- everything looks amazing!!! Have a great week girl! You girls look gorgeous and OMG that food looks heavenly!!! Everything looks SO delicious and the restaurant itself looks like it has such fun vibes! LOVE your sunnies girl! gosh we ate so much food yesterday but it was so good! i'm still full haha. and i love the outside and half inside vibe. def will go back for HH! Ugh this loosk so so yummy! I love the menu everything looks so good! And I love the vibes of the place so fun! OMG the food looks amazing! What a great brunch find! Thanks for sharing!! Yum! Next time we're in the Orlando area, I may need to drag the mister - esp for $15 bottomless mimosas! You eat the best food every weekend! And I've yet to eat my Kind bar, so now I'm officially starving! Bulla looks fantastic!! I'm totally hungry now. YUM! Brunch is definitely my favorite! My weekdays would be much better if we could sneak away for brunch. Everything looks delicious -- seriously made my mouth water! The food looks SO GOOD! I looove brunch. The food looks delicious and how cute is the decor?! You and Kerri look fab too! The food looks so yummy! You all look so cute, as always! I was practically drooling over the pictures of the meat and cheese trays that you snapped on Sunday because it all looked so good! And you really can't beat bottomless mimosas or sangria for that cheap other! Definitely sign me up! Looks like such a fun restaurant! I love that they have a tasting menu for brunch -- I don't think I've ever seen that. All the food looks incredible! Happy Monday! Such a fun spot, all of that food looks so good! You and Kerri are too cute! This food looks delicious! And you guys look fantastic, as always! Happy Monday! The decor and ambiance sounds so nice, and allllll of the food looks delicious! This is making me starve at 7am, haha. I love all of the new places in Orlando!! Yum! All of this food looks so good! A brunch tasting menu - that's amazing! Bottomless drinks are the best - that sangria looks delicious! Everything looks so yummy- but you really had me at bottomless mimosas + sangria! YUM. This is a dangerous post to read pregnant, everything looks SO good!